China’s recent growth has called attention to the power-transition theory, which contends that the danger of a major war is the greatest when a rising dissatisfied challenger threatens to overtake a declining satisfied hegemon. 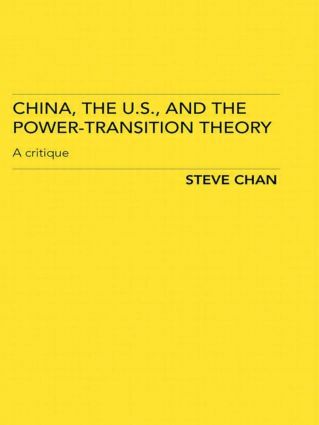 Steve Chan questions this prevailing view by analyzing the extent of ongoing power shifts among the leading powers, exploring the portents for their future growth, and seeking indicators of their relative commitment to the existing international order. To better understand the strategic motivations of ascending and declining states, insights are drawn from prospect theory and past episodes of peaceful and violent transition (such as the end of the Cold War and the outbreak of the First and Second World Wars). He concludes that China is unlikely to instigate a confrontation with the US, and that whilst military conflict over the Taiwan Strait is possible, this is more likely to be due to China’s inability to prevent US involvement than its willingness to provoke the US. This book places China in a comparative and historical context, in which inquiry is informed by the experiences of other major powers and pertinent theories in international relations, such as those on extended deterrence, preventive war, and democratic peace. Its comparative and theoretical orientation and its contrarian perspective will be of great interest not only to students and scholars of international relations and Chinese politics, but also to policy makers and professionals.